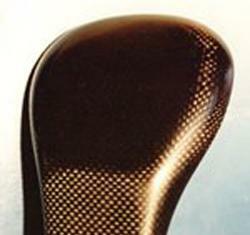 The carbon headrest is an ultra lightweight item and offers an excellent support of the head. Especially when using a small seat angle the support of the head can be pleasant. The headrest is delivered with a cushion that not only supports the head but also absorbs impacts from bumps in the road surface. The M5 head cushions are covered with the same perforated super textile as our seat cushions.